When Rockefeller and Luce bailed on Cinerama in July 1950, those other East Coast investors decided to take a pass as well, and Cinerama Corp. was dissolved in August. After buying out Rockefeller and Luce for a song, Hazard Reeves doubled down — he quite a bit more than doubled, in fact. In September he formed a new corporation, Cinerama Inc., in which Reeves Soundcraft was the principal stockholder, and set about tackling the challenges of moving Cinerama forward. The demonstration screenings at the converted tennis court continued. There were nibbles from independent producer Hal B. Wallis and a consortium of theater owners, but nothing came of them. In the autumn of 1950 Cinerama got two big bites. 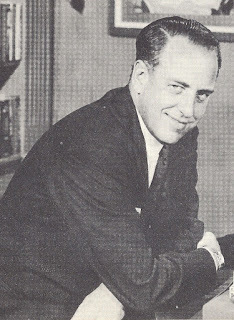 Buz Reeves invited Lowell Thomas out to Oyster Bay to have a look; Thomas invited his business manager Frank M. Smith to come along, and Smith in turn invited another of his clients, theatrical producer Michael Todd. It’s hard to explain Lowell Thomas to people who don’t remember him; even the Library of Congress was at a loss when it came time to classify his memoirs (they finally filed them under “biographies of subjects who don’t fit into any other category”). Born in 1892, he graduated from high school in 1910 and by 1912 (if we can believe Wikipedia) he had three bachelor’s degrees, plus an M.A. from the University of Denver. He worked as a reporter for the Chicago Journal, where he specialized in travel articles, which he expanded into lectures accompanied by motion pictures, thus pioneering (indeed, virtually inventing) the concept of travelogue movies. As a correspondent in the World War I Middle East, he became world-famous for his coverage of the campaigns of T.E. Lawrence; subsequent lectures in New York and London spread the legend of Lawrence of Arabia. In 1930 he began 46 years of daily radio news broadcasts, first on NBC and later CBS, that made his resonant baritone one of the most familiar voices in America. 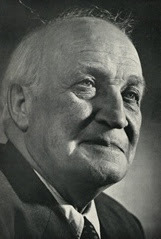 His famous greeting (“Good evening, everybody.”) and sign-off (“So long until tomorrow.”) became the titles of his two volumes of autobiography. 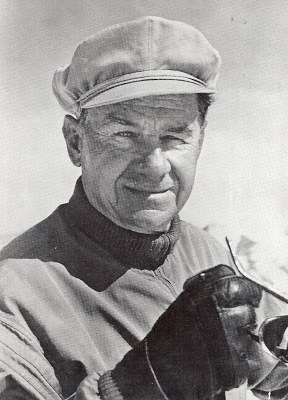 He wrote over 50 books in all, most of them chronicling his incessant world travels (the Society of American Travel Writers has an award named after him). 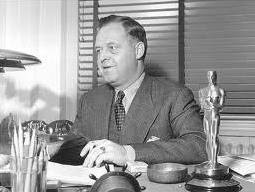 When he became the voice of Fox Movietone News in the 1930s, it was he who lent stature to the newsreel, not the other way around. By 1950 he was one of the most respected men in American media. Lowell Thomas and Michael Todd had little in common beyond an instinct for showmanship and a flair for self-promotion, but they shared an avid enthusiasm for what they saw out in Oyster Bay. They also shared a business manager, Frank Smith, and that was enough for Smith to set up Thomas-Todd Productions Inc., licensed by Cinerama Inc. to produce and exhibit Cinerama movies. Thomas and Smith put up most of the money; Todd got stock in the corporation but, not surprisingly, didn’t put up any of his own money — his main contribution was to be his talent as a showman. In a parallel development, Cinerama Inc. had its initial public offering on the New York Stock Exchange in January 1951. Also in early 1951 Thomas-Todd, or so the story goes, approached documentary master Robert Flaherty to direct the first Cinerama picture. 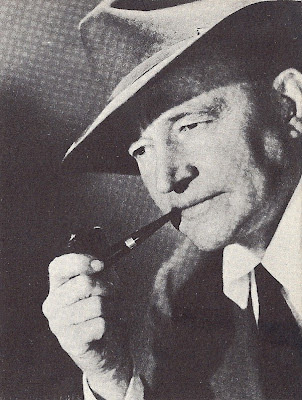 Flaherty reportedly agreed, but he died in July ’51 as shooting was about to begin, leaving behind no notes or records to indicate what, if anything, he intended to do with Fred Waller’s process. This put Thomas and Todd back at square one. In Europe Todd and his son Mike Jr. filmed a number of sights and events: a gondola cruise through the canals of Venice, a bullfight in Madrid, the gathering of the clans of Scotland in Edinburgh, a performance by the Vienna Boys Choir in the gardens of Schonbrunn Palace. In a major coup, Todd Sr. even talked his way into the La Scala Opera in Milan, where no movie cameras had ever been allowed, to shoot a full-dress performance of the Act I finale to Verdi’s Aida. Back in the States, they filmed a flyover of Niagra Falls and did a Technicolor re-shoot of Waller’s black-and-white rollercoaster demonstration reel. In any case, there was an ulterior motive in enlisting Cooper: Mike Todd’s presence was becoming increasingly problematic. His domineering bull-in-a-china-shop style was beginning to grate on people. More important, perhaps, Todd’s presence spooked Wall Street. Thomas-Todd Productions wasn’t publicly held, but Cinerama Inc. was, and Todd’s well-known profligacy with other people’s money made investors wary. Then again, there were some ominous attempts by creditors from Todd’s numerous bankruptcies to recoup their losses from one of the Cinerama companies. There seemed nothing for it but to squeeze Todd out. 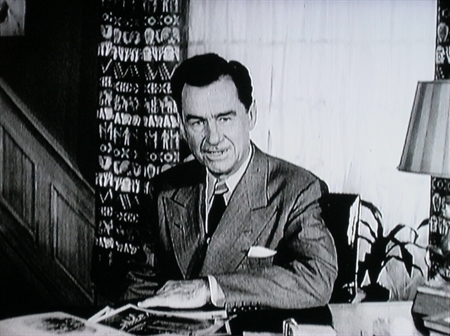 By March 1952 it was announced he’d be taking a “leave” from Thomas-Todd Productions and Cinerama, and in August Thomas-Todd was dissolved, replaced by Cinerama Productions Corporation, with Lowell Thomas as chairman of the board. Mike Todd’s 14 months on the scene left their mark, however, and not just for his storming the gates at La Scala; nearly the entire first half of what would become This Is Cinerama was supervised either by him or by Mike Jr. In the few years left to him (he died in a plane crash in March 1958), Todd would have his own story about his departure from Cinerama, a sort of you-can’t-quit-me-I’m-fired version. He said his associates at Thomas-Todd and Cinerama Inc. were too conservative and wary of taking chances: “We can’t stay on that roller-coaster and in the canals of Venice forever. Somebody has to say ‘I love you’ some day.” He also thought he could do better than Cinerama’s three-frame picture, and he wasted little time enlisting the services of the American Optical Company to develop the 70mm Todd-AO process, the only one of Cinerama’s many progeny that ever really challenged its supremacy. But that was still in the unseeable future. Now, with Todd safely out of the way, Thomas and Cooper secured an additional $600,000 to complete their picture. 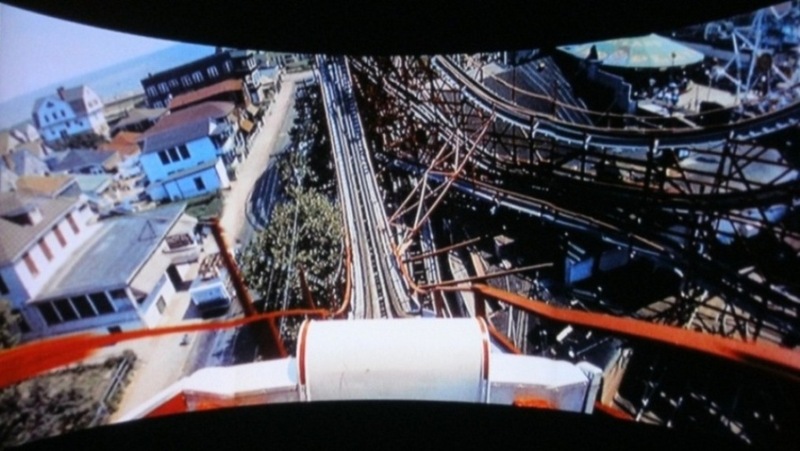 To counteract the largely static footage in all those European sections, Cooper had the Cinerama camera in fairly constant motion for the two long sequences that would make up the second half. First was a colorful aquacade at Florida’s Cypress Gardens (coincidentally, much of the show consisted of strapping young men and nubile bathing beauties cavorting on Fred Waller’s other invention, water skis). For the grand finale, Cooper hired stunt flyer Paul Mantz to pilot a modified B-25 bomber across the country for a bird’s-eye view of the natural and man-made wonders of America, set to the tune of the Mormon Tabernacle Choir singing “America the Beautiful”. 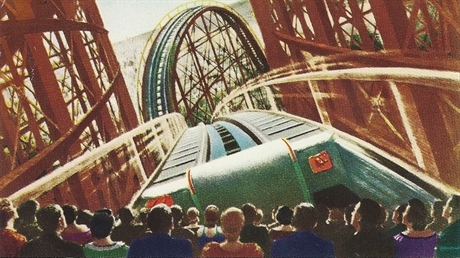 Cooper also took on the task of determining what would go into the feature, and in what order — where others wanted to save the rollercoaster for the climax of the picture, Cooper insisted on hitting ’em hard right out of the gate. Preparations for the premiere proceeded feverishly right up to the last minute — Mantz’s “amber waves of grain” shots weren’t ready for the projectors until just twelve hours before showtime. And, as we’ve seen, the result was a triumph beyond the dreams of everyone involved. New York Times critic Bosley Crowther, in an unprecedented front-page review, called it “an historic event in the history of motion pictures.” Cinerama, as it was called before This Is was added to the title, became overnight the hottest ticket on Broadway. Everyone in the picture business recognized it at once as a game-changer — much more so, in fact, than they had The Jazz Singer in 1927. The question on everyone’s lips in the weeks that followed was the same one that Fred Waller, Lowell Thomas, Buz Reeves and their investors were asking themselves: What’s next for Cinerama? Fox president Spyros Skouras spared him the embarrassment of that. Skouras had gone out to Oyster Bay too, and been impressed, but he allowed Fox’s research department to talk him out of buying into Cinerama. Now, as This Is Cinerama‘s sensational debut woke Hollywood from its slumber, Skouras turned to his research department, saying in effect: You blew this one, boys; you’d better make it good. They did. Digging back, they came up with a process a French professor named Henri Chretien had tried unsuccessfully to peddle in Hollywood back in the ’20s. He called it Anamorphoscope, and it involved using what Chretien called a “hypergonar” lens on the camera to squash a wide angle of view onto standard 35mm film, then a compensating lens on the projector to stretch it back out again. The good news was that Chretien’s patent had expired in 1951 and Anamorphoscope was now in the public domain; the bad news was that Chretien had the only set of lenses. Long story short, Skouras tracked Prof. Chretien to his home in Nice, reached an agreement for the use of his lenses (which were later refined and reproduced by Bausch & Lomb back in the States), and in February 1953 Skouras announced the process under a new name, CinemaScope (whoever came up with that replacement for “Anamorphoscope” surely earned his pay for the week!). The first CinemaScope picture was to be Fox’s Biblical epic The Robe (pre-production was already underway, but suspended to retool for the new process), and henceforth every 20th Century Fox picture would be shot in CinemaScope. 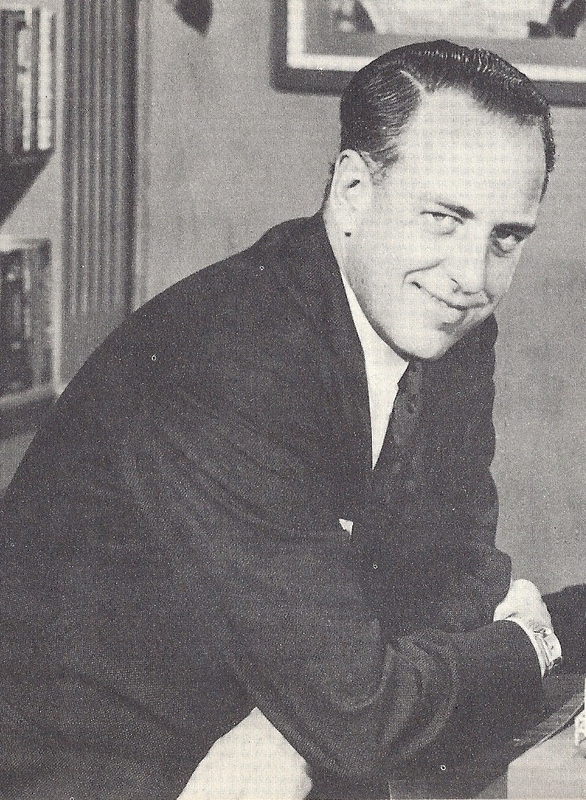 Skouras and studio chief Darryl F. Zanuck encouraged other studios to sign on with their “new” process. MGM and Walt Disney took the bait at once; other studios hung back, exploring their own wide screen options. Early ads for CinemaScope, like the one I’ve reproduced here, emphasized a resemblance to both Cinerama and 3-D (“It’s the miracle you see without glasses!”) that didn’t really exist. 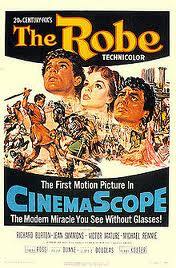 While CinemaScope did originally call for a curved screen, most theaters didn’t bother with that. Even in The Robe‘s first-run engagements, the curve was much shallower than in this ad, and nowhere near as deep as Cinerama’s. (A good thing, too: you have to feel sorry for that poor sucker on the left end of the seventh row — what kind of view could he have had?) Anybody who compared Cinerama and CinemaScope side-by-side (so to speak) could see there was no real comparison. But in truth, most moviegoers couldn’t do that. Among Hollywood professionals, CinemaScope didn’t have to be as good as Cinerama, as long as they could sell it that way to the millions who hadn’t yet seen the real McCoy. Besides, it was still a huge change from movies-as-usual, and something folks couldn’t get on those newfangled television sets. 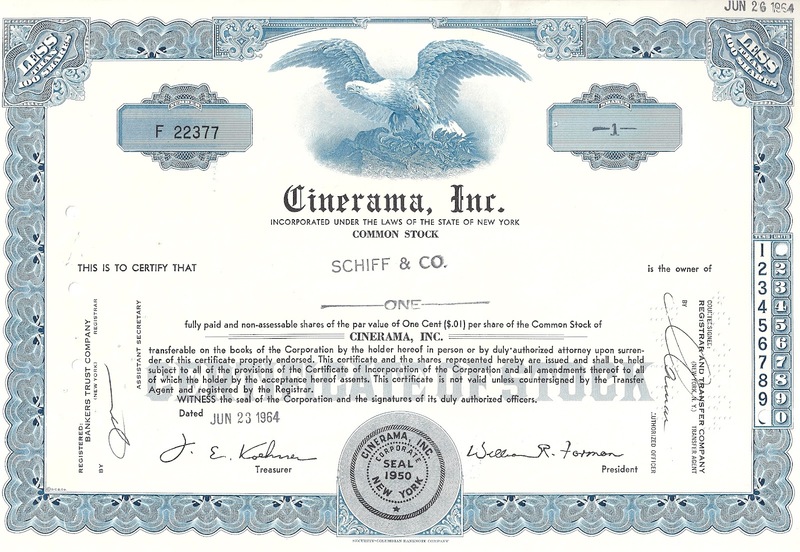 Fox mounted an aggressive and well-organized campaign to promote CinemaScope (Skouras was battling a hostile takeover, so ‘Scope had to succeed), and in the end it would effectively sink Cinerama Productions Corp.’s hopes of partnering with one of the major studios. 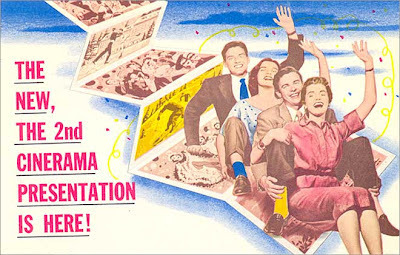 Even as early as March and April ’53, when Fox began holding nationwide demonstrations of CinemaScope for industry and press, Cinerama was feeling the pinch. Not only were leads on new investment drying up, but some contractually committed investors were backing out, citing a “changed circumstances” escape clause in their contracts. 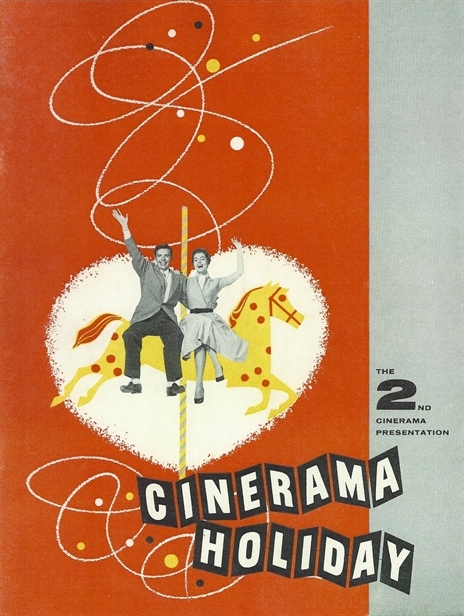 Cinerama still had only three venues in the world (a fourth, the Palace in Chicago, wouldn’t open until July due to a protracted haggle with the local projectionists’ union). Cinerama Productions Corp. had to find funding to supplement their high-overhead box-office take if they were going to open more theaters and maintain a foothold in the market they had created, to say nothing of producing follow-up features to This Is Cinerama. They considered their options. A public stock offering was one, but sales of Cinerama Inc. stock had already been less than expected. Another possibility was to seek financial participation from a theater circuit rather than a studio, and they decided on that. A logical choice for such an arrangement was the Stanley Warner Corporation, since Cinerama had already been dealing with them: the newly Cineramified Warner Theatre in Los Angeles was theirs, and This Is Cinerama was slated to move from the Broadway Theatre to New York’s Warner in June 1953 (the Shubert brothers wanted their house back). Before we go on, a clarification: “Stanley Warner” wasn’t a person. 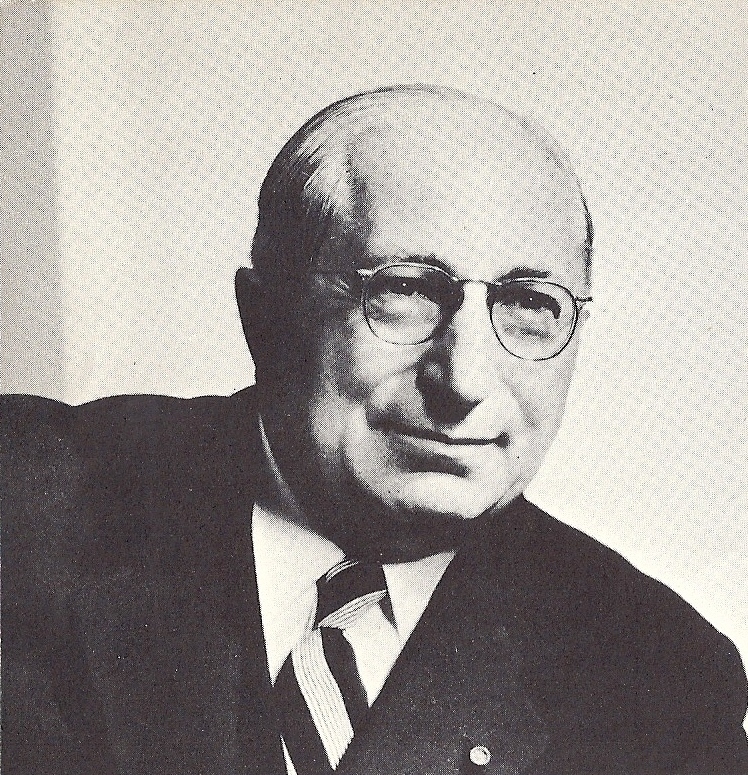 How the name came about (as simple as I can make it) was this: Stanley Warner’s president was S.H. Fabian, who had gotten into the theater business in his father’s small circuit of houses in New Jersey in the 1920s. In 1926 Fabian Theatres merged with another chain, Stanley Company of America. Two years later that circuit was acquired by Warner Bros. for the exhibition of their pictures, and Fabian partnered with one Samuel Rosen to rebuild his own chain in New York State, Fabian Enterprises. In the early 1950s, when federal antitrust action compelled the studios to divest themselves of their theater chains, Fabian went to Harry, Albert and Jack Warner to (essentially) buy his old theaters back. The corporation he formed for this might have been called Fabian Rosen, or Warner Fabian, but instead it was Stanley Warner. As the corporate heir (as it were) to Warner Bros. Theatres, Stanley Warner became a party to the federal suit’s consent decree, and needed approval from federal court (and by extension the U.S. Dept. of Justice) for any venture into movie production, distribution or exhibition. That included any agreement with Cinerama Productions Corp., so it added yet another layer of negotiation. A tentative agreement for Stanley Warner to take over Cinerama theater operations was announced in May 1953, but there were a multitude of details to work out. 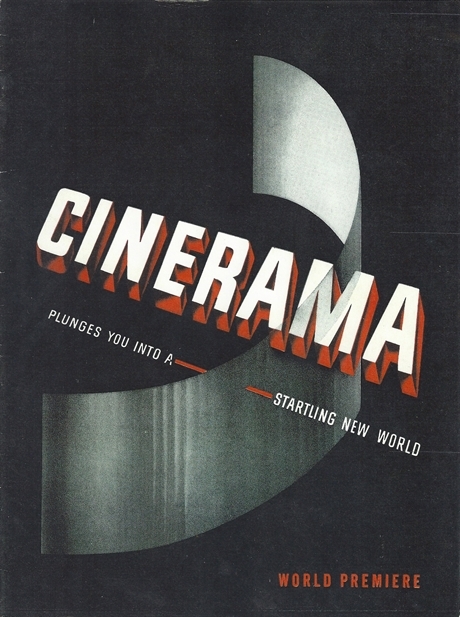 Cinerama Productions’ licensing agreement with Cinerama Inc. ran only through 1956, so Stanley Warner wanted a two-year extension of that to help recoup their investment. They also wanted control of production and distribution as well as exhibition, to ensure a steady flow of pictures for the theaters. Meanwhile, Cinerama Productions was behind in payments to Cinerama Inc. for equipment, so Cinerama Inc. wanted at least something towards that before any talk about extending the license. And the Dept. of Justice had their own demands before they’d recommend court approval. gamble had paid off in a big way. 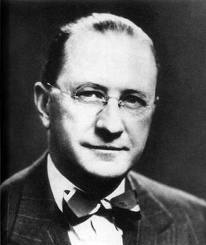 “Our original group of founders had dwindled — Fred Waller, the gentle, bespectacled genius who started it all, had died before he even knew of his triumph; Mike Todd was busily hustling and working with American Optical on the process to be called Todd A-O … Arrayed against [Frank Smith], Merian Cooper and me were men of wealth who had gone into Cinerama solely for the investment possibilities, and at this critical juncture, either unwilling to go looking for the additional cash or simply ready to take their already large profits, they opted to sell out. But Thomas’s basic point was well taken. The folks at Stanley Warner were not film producers. And despite S.H. Fabian’s advocacy of alternate entertainment technologies — he was an early proponent of drive-in theaters, 3-D, and closed-circuit theatrical television — he really didn’t know what Cinerama was all about. Even if nobody heard it at the time, the bells were definitely tolling. Thomas can be forgiven a certain amount of bitterness. By May 1954, Stanley Warner had managed to open only seven new Cinerama theaters and had yet to complete a follow-up feature to This Is Cinerama; yet they had managed to scrape up $15 million to buy International Latex. Moreover, in the next four years SW would lavish far more care and resources on International Latex, where profit margins were high and they were not under the thumb of the U.S. Justice Dept. Small wonder that, decades later, Thomas remembered SW being already in the brassiere business when Cinerama came along. 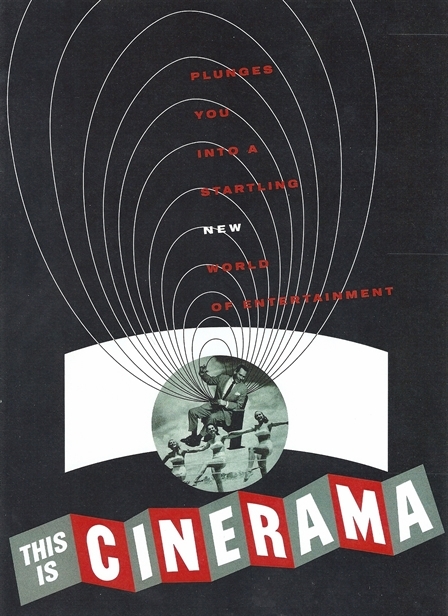 Stanley Warner was contractually obligated to produce a picture within the first year, and their original plan was the same as Cinerama’s before them: to involve one of the major studios in making pictures in the process. In early August, even before the court approved the buyout, talks were held with Columbia, Paramount and Warner Bros. All came to nothing, including a proposed picture about the Lewis and Clark expedition to star Gregory Peck and Clark Gable as the great explorers (excellent casting, that). With the success of The Robe, studios began stampeding to CinemaScope in preference to the more expensive Cinerama, and any chance of a deal in that direction evaporated. SW negotiated with Merian Cooper, who was thinking of molding Paul Mantz’s 200,000 feet of aerial footage into a picture to be called Seven Wonders of the World, but talks broke down when they couldn’t agree on a completion schedule. So Stanley Warner turned to producer Louis de Rochemont, who had experience in both documentary (We Are the Marines, the March of Time newsreel shorts) and fiction filmmaking (The House on 92nd Street, Boomerang!). De Rochemont had an idea that combined the two: follow one pair of American newlyweds as they honeymooned in Europe, and another European pair as they honeymooned across America. The Thrill of Your Life began shooting in December 1953 with John and Betty Marsh of Kansas City, Mo. and Fred and Beatrice Troller of Zurich, Switzerland touring the Cineramic stops on their respective honeymoon tours. Production wrapped in June ’54 and, with the title changed to Cinerama Holiday, the picture was ready for release by the August deadline. But Stanley Warner held off on releasing Holiday. By this time there were 11 Cinerama theaters in operation, and This Is Cinerama was still playing to sold-out houses everywhere — even in New York, where it was nearly two years old. Why cut a thriving box office short when there was still a lot of money to be made? And here’s where Cinerama’s can of corporate worms came home to roost — if you’ll forgive a mixed metaphor. At one end of the corporate arrangement was Vitarama and Cinerama Inc.; at the other end was Cinerama Productions — now a mere holding company for Stanley Warner Cinerama, but with its own stockholders. And in between was Stanley Warner. Cinerama Inc. made most of its money from the equipping of Cinerama theaters — the sale or lease of equipment and supplying of replacement parts — and was annoyed that Stanley Warner wasn’t opening theaters at a quicker pace. The remaining investors in Cinerama Productions were annoyed that SW wasn’t opening more theaters and producing a steadier stream of pictures to show in them. 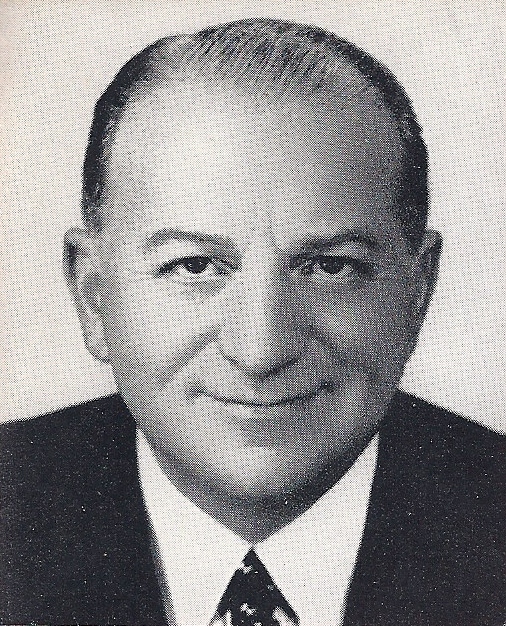 And Stanley Warner, who had to put up all the money for both the theaters and the pictures but had to share almost half of any profits (when operating costs alone could eat up as much as 90 percent of gross ticket sales), was beginning to wonder if investing in the process had been such a good idea in the first place. The cracks among the partners in Cinerama were beginning to show, and were the subject of chatter in the trade press. The general public, however, saw none of this. All they knew, if they hadn’t seen This Is Cinerama yet, was that Cinerama was the miraculous more-than-a-movie that everybody was talking about. If they had seen it, all they knew was that the theater was jam-packed, at top-dollar prices; if they saw it more than once, showing that their own enthusiasm hadn’t dimmed, they saw that nobody else’s had either. And when Cinerama Holiday finally opened in February 1955, the box office didn’t fall off a dime. Movie houses in towns or neighborhoods may bring in picture after picture in CinemaScope, but to the public Cinerama was the gold standard. More than a movie, indeed — it was a tourist attraction. There had been talk of plans to expand Cinerama into foreign countries almost from the first opening in September 1952, but nothing had ever come of that idea. In the spring of 1954, Stanley Warner sought to farm out the foreign exhibition rights — find somebody who would foot the bill for overseas expansion and pay SW for the privilege. After three months of negotiations, S.H. Fabian hammered out a deal with Nicolas Reisini, president of Robin International. Neither Robin International nor the Greek-born Reisini had any experience in the movie business. Robin International was reportedly an import/export company, although exactly what it imported and exported wasn’t clear. Nothing shady, mind you, it’s just that Reisini seems to have had his fingers in a bewildering number of pies — none of them having anything to do with the movie industry. But there was another factor. 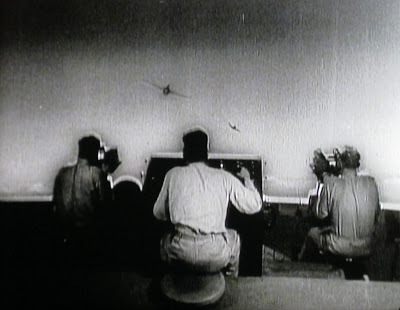 According to his son Andrew (interviewed for David Strohmaier’s 2002 documentary Cinerama Adventure), Nicolas Reisini as a young man had seen the Paris premiere of Abel Gance’s Napoleon in 1927 and been spellbound — especially by Gance’s three-screen “Polyvision” triptych that climaxed the picture. 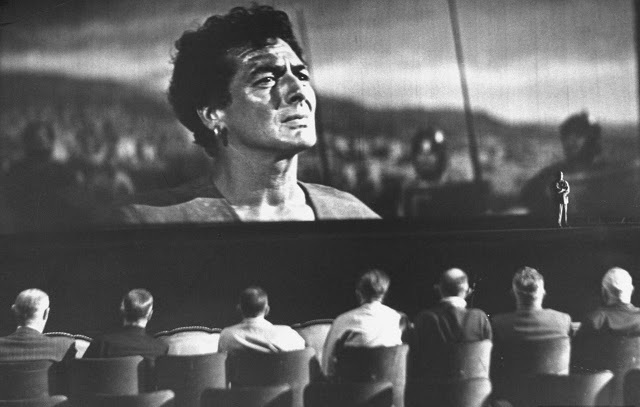 When Reisini saw This Is Cinerama in New York in late ’52 or early ’53, it revived that youthful excitement and seemed to be the fulfillment of Gance’s earlier vision. Son Andrew says Reisini decided on the spot that he wanted to get in on Cinerama one way or another, and when Stanley Warner went looking for someone to buy foreign rights, Reisini was ready. 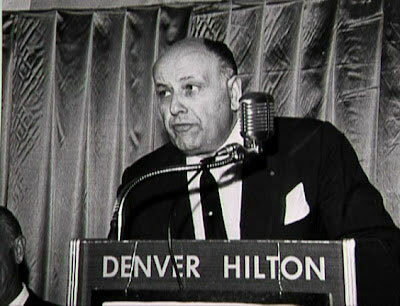 Reisini’s deal, announced in July 1954, licensed him to establish Cinerama theaters in any five cities (later amended to six) outside the western hemisphere. He ponied up a deposit of $500,000, to be refunded $100,000 at a time for each new theater as it opened. Robin International was responsible for all the expenses of converting and operating the theaters. And with this agreement, yet another corporation was added to the cluster of those already in place, each straining for its share of the trickle of profits that remained after Cinerama’s sky-high operating costs. Robin International’s first “permanent” theater was the Casino in London, opening October 1, 1954. 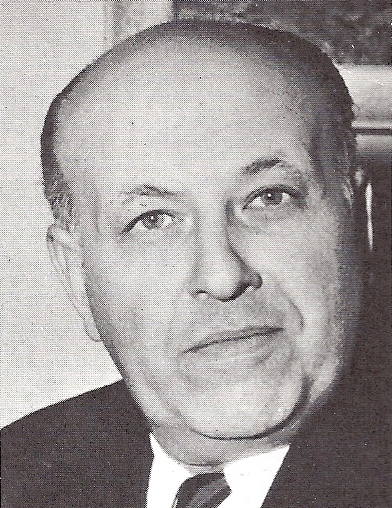 Reisini reduced his own expenses by sub-licensing to local exhibitor companies in each country, letting them shoulder the cost of converting and equipping the theater (more corporations, more straining for ever-thinning profits). That’s how it went when theaters opened in Japan (Tokyo and Osaka, January ’55), Italy (Milan, April ’55; and Rome, in May) and France (Paris, May ’55). Meanwhile, back home, Stanley Warner and Louis de Rochemont had fallen out over money — and SW’s reluctance to invest in perfecting the Cinerama process. De Rochemont stalked off to produce Windjammer: The Voyage of the Christian Radich in CineMiracle (a competing process just different enough to avoid infringing Cinerama’s patents). 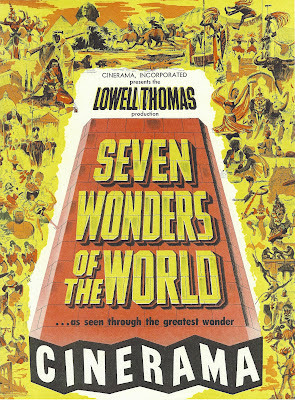 SW had enticed Lowell Thomas back to produce Seven Wonders of the World (revived after the departure of Merian Cooper). Shooting wrapped in June ’55, but as with This Is Cinerama before it, Cinerama Holiday was drawing so strongly that SW was in no hurry to release Seven Wonders (it finally opened in April 1956). In the interim, Stanley Warner had produced two more travelogues, another one with Lowell Thomas (Search for Paradise, about India and the Himalayas), September ’57; and South Seas Adventure with producer Carl Dudley, narrated by Orson Welles, July ’58. And with that the Stanley Warner era at Cinerama came to a close, after four pictures in five years. (For the record, in that same time 20th Century Fox and the other Hollywood studios had produced 291 pictures in CinemaScope.) When the dust from the transition settled, the new big cheese at Cinerama Inc. was none other than our starry-eyed friend Nicolas Reisini. He was an adroit wheeler-dealer who loved Cinerama and had a genuine vision for the process, and he would accomplish things that nobody before him had been able to do. But he would also fall victim to Cinerama’s chronic cash-flow problems, and in the end he presided over the process’s march into oblivion. I’ll get into that next time, then I’ll add a brief coda about the mechanics of Cinerama, and efforts to perfect Fred Waller’s revolutionary invention. Even so, Waller never considered that night’s showing to be Cinerama in its final form; this was, in a sense, only the “third generation” version. Just as he had refined Vitarama’s 11 cameras and projectors down to five, and those five down to Cinerama’s three, he fully expected that the process would continue to evolve. Truth be told, there was room for improvement, and Waller knew it. Some of Cinerama’s technical problems can be discerned in this frame (frames, actually) from Search for Paradise — although to be fair, by the time this picture was shot most of them had been considerably alleviated. Most often complained about were those dividing lines between the three panels. The panels overlapped by a degree or two, which meant that the overlap area would inevitably get the light from two projectors. To minimize this over-exposure, the sides of each projector’s film gate were supplied with little devices called (spellings vary) “gigolos”. These were serrated, comb-like assemblies mounted on cams that moved them up and down, once for each frame (i.e., 26 times per second) as the film passed through the gate. This was intended to cut down on the excess light hitting the overlap, and to blur the sharp division from one panel to the next. As a matter of fact, this worked reasonably well. Actually, when people remarked on Cinerama’s join lines, they were reacting not so much to the lines themselves, but to other technical peculiarities that tended to draw attention to them. 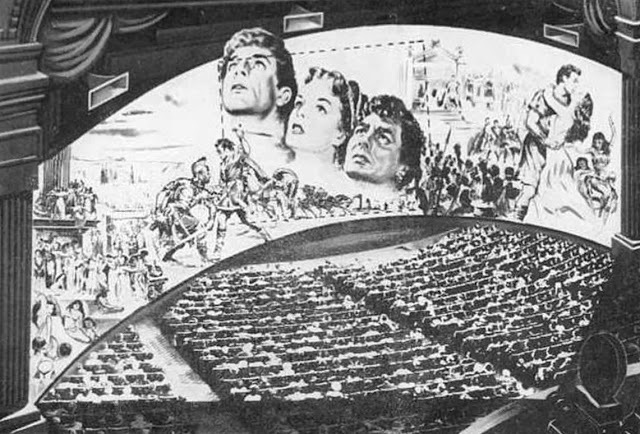 The resolution isn’t very high on this illustration of a shot from This Is Cinerama (photographed live in the theater), but it shows some of what I’m talking about. There were often variations in color and intensity from one panel to the next (particularly noticeable in the sky here). Several factors could contribute to this: minute differences in the emulsion on the three negatives, or in the processing and printing, or in the intensity of light from the carbon-arc projectors. The carbons burned away during operation, like fireworks sparklers but more slowly, requiring constant adjustment and frequent replacement (that’s a major factor in why carbon arc projectors and searchlights became obsolete). 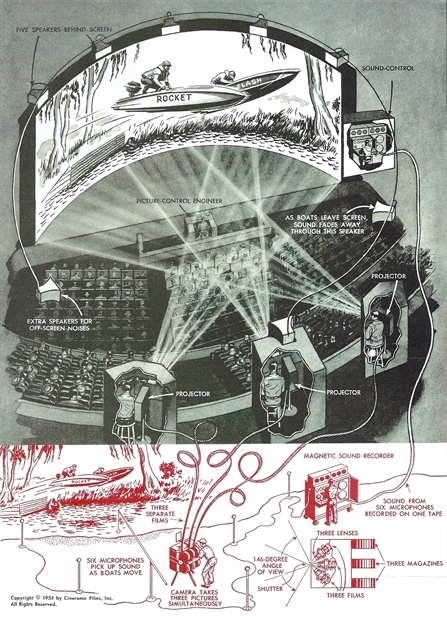 Cinerama’s carbons multiplied the problem by three, and all three had to be closely monitored during each show to keep the light output as uniform as possible. Also contributing to this was the three lenses of the Cinerama camera, each of which was “faster” (admitting more light) at the center than at the edges. Another occasional peculiarity that can’t be shown by a still illustration was a perceptible “jiggle” between the frames, caused again by minute variations — this time in the film perforations, the sprockets in the separate camera and projector movements, or a combination thereof. Most noticeable of all was the parallax effect caused by the fact that the Cinerama camera was really three cameras, each with its own vanishing point. Take this frame from the last scene of How the West Was Won, flying under the Golden Gate Bridge. This is taken from the DVD; the join lines have been digitally erased, and the “elbows” in the bridge (quite pronounced in the theater) have been rounded out — but the digital wizards couldn’t do anything about how the three lenses saw the bridge. Imagine yourself looking out at a vista: First you look straight ahead; then you take a step to your right and turn your head left; then two steps left and turn your head right. You’re looking at the same view each time, but from three ever-so-slightly different places. That’s how it was with the Cinerama camera. The parallax wasn’t always obvious — especially when you were careening up and down rollercoaster tracks or swooping over Niagara Falls or through Zion Canyon in Utah — but when it was, it was impossible to ignore. These were the things, as Cinerama opened in September ’52, that Fred Waller expected eventually to fine-tune. Early in 1953, as 20th Century Fox was beginning to beat the drum for CinemaScope, Cinerama announced plans for a single-booth, single-projector system. But that may simply have been a blue-sky announcement intended to take some of the wind out of CinemaScope’s sails. In any event, nothing ever came of it, at least not until It’s a Mad, Mad, Mad, Mad World ten years later — which, despite sporting the name, wasn’t Cinerama at all. Also, by spring ’53, the Stanley Warner deal was in the works, and was finalized in August. Stanley Warner’s penny-wise-and-pound-foolish attitude toward Cinerama in general extended into the area of technical research, and Cinerama Inc., the manufacturing wing of the operation, was forced to eke out what technical improvements it could under the circumstances. New camera and projector assemblies were developed for the second feature, Cinerama Holiday, which had much greater registration accuracy than the industry standard, thus reducing considerably the jumping and jiggling of the three images. These new cameras also had improved focal ratios on the three lenses — from f/4.5 to f/2.8 — making them more sensitive to light. As for the problem of slight variations in color, that was dependent on printing standards, which in most laboratories, as Hazard Reeves admitted, “have never been tight. If necessary,” he went on, “we’ll do our own printing.” But once again he ran up against the cheapskates at Stanley Warner. Not until 1958 did they agree to allot $200,000 for research into improved printing standards, and it wasn’t enough; Cinerama’s special in-house printers never materialized. On May 18, 1954 Fred Waller died, and Cinerama lost its creator and conceptual genius. For all practical purposes, Cinerama remained, for the next (and last) nine years of its existence, what it was when Waller left it; the continuing evolution he envisioned would never happen — because there were no more Fred Wallers to drive it. Waller left behind one final concept, designed to address the parallax problem inherent in Cinerama’s three-lens camera. This was a radically modified camera using a single lens that would duplicate the entire 146-degree field of vision of the three-lens camera, but on a single strip of film running horizontally through the camera 16 sprocket-holes at a time — the rough equivalent of a 102mm frame. This would eliminate the three-lens parallax, producing an image with a single vanishing point. That 102mm image could be divided in printing into three strips for projection (still necessary to cover Cinerama’s deeply curved screen) — and, as a bonus, could also be printed single-frame in any other format for conventional projection. 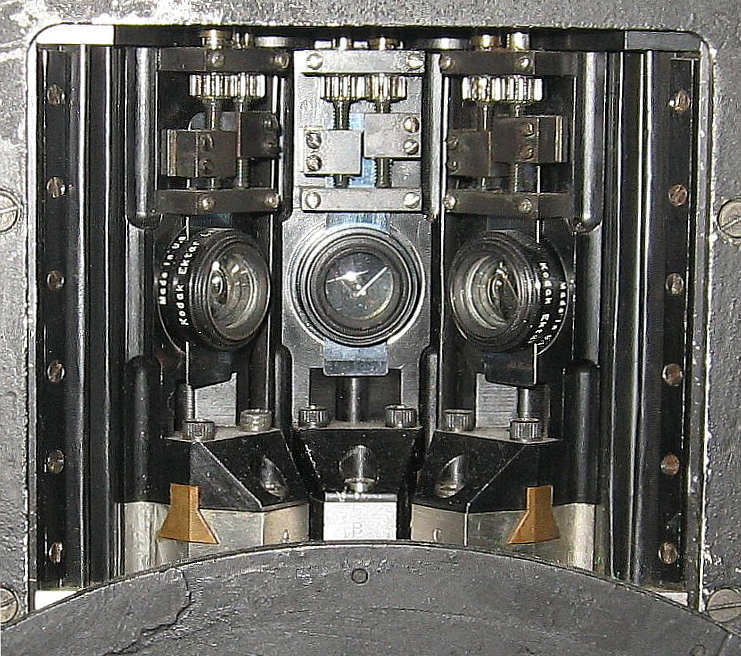 The lens had been developed and a prototype camera was under construction in 1960 when the order came to abandon any further development. 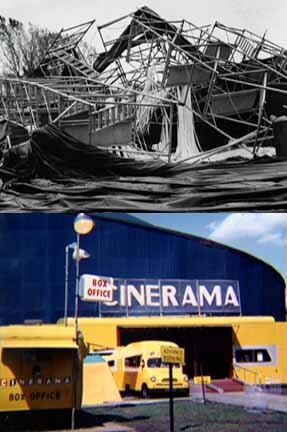 In 1962, under Nicolas Reisini, Cinerama Inc. acquired the Photo Instruments Division of Benson-Lehner Corp. in Los Angeles, renaming it the Cinerama Camera Corp. Reisini might (and maybe should) have dedicated the new corporation to resolving the technical problems in Cinerama, perhaps even reviving that 102mm camera. But he didn’t. Instead, Cinerama Camera Corp. attempted to move into consumer products: a still camera that took 360-degree panoramic pictures, a wide-angle home movie projector, even (and I’ll bet you never knew this) a home videotape recorder. All of these ideas lost money in research and development (the videotape recorder was 20 years ahead of its time), and by 1964 Reisini had been ousted from Cinerama. The untapped potential of that single-lens, 102mm, 146-degree camera — Fred Waller’s last brainchild — is one of the great what-ifs of motion picture technology. Let us now praise John Harvey. Somewhere in my scattered stacks of pre-digital photographs, I have a picture I took of John Harvey posing proudly beside one of his Cinerama projectors. I’ve been ransacking the house for over three months now, all the time I’ve been preparing and posting this series on Cinerama, and I absolutely cannot find the damned thing, or any of the other pictures I took on my visit to John’s home town of Dayton, Ohio in 1996. So I’ve given up and decided to make do with this image from the supplemental materials on the This Is Cinerama Blu-ray. I’ll keep looking, because it’s important: I knew from the start that this whole series was going to culminate in a grateful tribute to John. Besides, those pictures aren’t just important to me. They’re historic. Not to mince words or beat around the bush, John Harvey is the man who — virtually singlehandedly — preserved Cinerama for posterity. His service to movie history can scarcely be overstated. This is not in any way to minimize or overlook the efforts of others who have often worked above-and-beyond to ensure the survival of Fred Waller’s marvel. Just a few examples: The International Cinerama Society was instrumental in seeing that Cinerama was installed at the National Media Museum (formerly the National Museum of Photography, Film and Television) in Bradford, UK. John Sittig, who recently retired as Director of Projection and Sound for ArcLight Cinemas, performed a similar service for the installation of Cinerama at ArcLight’s Cinerama Dome in Hollywood (he also capped his career by putting together last month’s 60th Anniversary Cinerama Festival at the Dome). 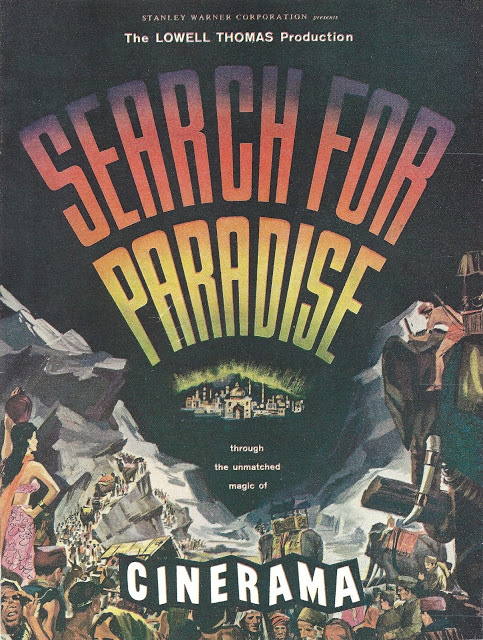 David Strohmaier’s 2002 documentary Cinerama Adventure was — besides being one of the best movie-themed documentaries ever made — a major step in retrieving the forgotten process from the memory hole of the 1950s and ’60s (Strohmaier also wrote, directed and edited the 30-minute short In the Picture , the first picture in Cinerama since How the West Was Won). And Australian collector John Mitchell has done much at his end of the globe — it was his prints of Search for Paradise and The Wonderful World of the Brothers Grimm that screened at the festival in Hollywood. But before any of them — back when the ICS was still scouring the world for parts to put in that museum in Bradford, when David Strohmaier was just beginning to wonder what ever happened to Cinerama — John Harvey had been hosting screenings of This Is Cinerama and How the West Was Won for years. In his living room. Harvey’s interest in the movie projectionist’s craft began at an early age in Dayton. At the age of 10 he’d tag along when his older brother went to work at the local drive-in theater, and he began to wonder about the kind of machine it would take to project movies onto that massive outdoor screen. 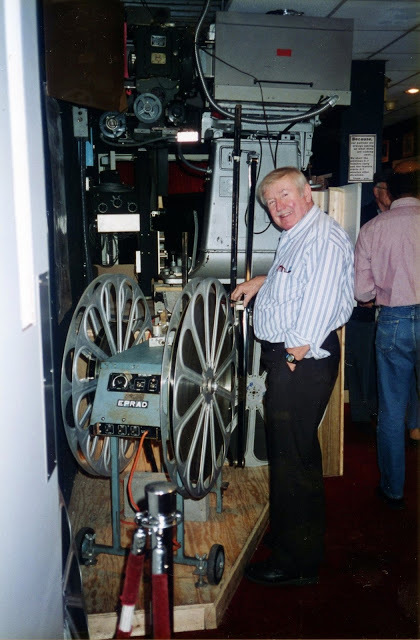 The projectionist noticed him peering in the windows night after night, invited him in to have a look around, and became his mentor, eventually sponsoring him into the projectionists’ union when John turned 17. 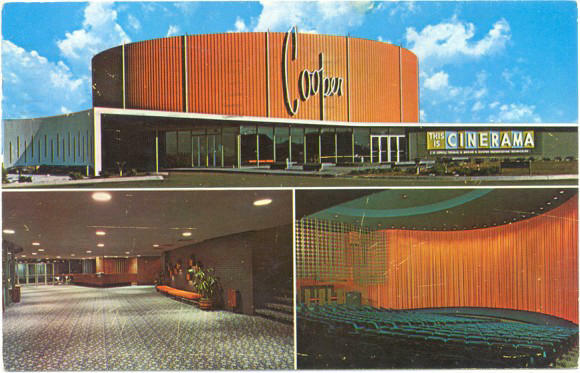 Meanwhile, when John was 16, his father (a loyal fan of Lowell Thomas) had taken the family to see This Is Cinerama when it opened at Cincinnati’s Capitol Theatre in 1954. For a boy with a budding interest in movie projection, here was movie projection on steroids; in time he would travel the 54 miles to Cincinnati to see all the Cinerama features at the Capitol. And when Dayton’s Dabel Theatre converted to Cinerama in 1963, John — now a union projectionist — worked backup to the Dabel’s crew, seeing How the West Was Won for 38 straight weeks and getting hands-on experience running a Cinerama setup. 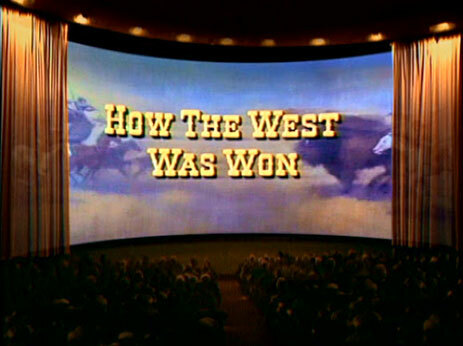 When three-strip Cinerama was abandoned after HTWWW, Harvey missed it. He saw clearly the difference with the “new” Cinerama movies like It’s a Mad, Mad, Mad, Mad World and The Greatest Story Ever Told (really only UltraPanavision — a big picture on a curved screen, but the viewer was no more “in” the picture than he would be standing in front of a billboard by the side of the road). In John’s search for film and equipment, he had made the acquaintance of Willem Bouwmeester of the Netherlands. 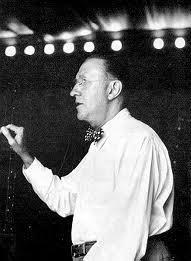 Like Harvey, Bouwmeester discovered Cinerama as a teenager and never lost his enthusiasm for the process. He grew up to work for IMAX in Europe and become a founding member of the International Cinerama Society, and from the Continent he had helped Harvey in his search. In 1993, when the ICS installed Cinerama at the Bradford museum, they sought and received advice and assistance from John Harvey. So now John’s house was no longer the lone outpost in a Cinerama-bereft world. But the only true Cinerama theater was in England; Cinerama remained a prophet without honor in the country of its origin (where it had once proved to be an honor without profit). As 1995 became 1996, the landlord of the New Neon Movies announced plans to split the already-modest theater down the middle and turn it into a two-screen venue. Larry Smith at last persuaded John it was now or never, and they hatched a plan that was brilliant simplicity itself: Before the remodel, the New Neon would install John Harvey’s screen, projectors and sound equipment. The theater would continue showing its standard art-house fare every evening, but on weekends there would be full-Cinerama matinees of This Is Cinerama (on Saturdays) nd How the West Was Won (Sundays). The landlord was doubtful the scheme would pay for itself, but he agreed to let Smith solicit a letter-writing campaign; if he could get 1,000 writers to pledge to come to Dayton for Cinerama, then they could talk. Ads went out in movie-buff publications all over the country, things like Classic Images and Films of the Golden Age, soliciting interest. By the deadline Smith had received 1,200 expressions of interest and pledges to attend; the next day another 200 arrived. “Can you say ‘no’ to fourteen hundred people at once?” Smith asked. And so the project got a green light — but only for an eight-week run. This Is Cinerama premiered a second time in America — and for the first time in over 30 years — at the New Neon on Thursday, August 29, 1996. The date was chosen to take advantage of the long Labor Day Weekend, but Harvey and Smith were in store for an eerie surprise. The guest of honor that night was Marianna Munn Thomas, widow of Lowell, and they learned from her that they had, without knowing it, brought This Is Cinerama back to America on the fifteenth anniversary of Lowell Thomas’s death. Now that’s what I call some kinda Karma. In October ’96, midway through the (supposedly) limited run, that’s what we did. I flew to my uncle’s home in Muncie, and from there we drove the 84 miles to Dayton. That’s when I met John Harvey and Larry Smith, and when I took all those pictures that I can’t find now. * And that’s when I had an experience I never expected to have again: seeing This Is Cinerama and How the West Was Won in honest-to-goodness Cinerama, the way Fred Waller and Lowell Thomas and Merian C. Cooper and Hazard Reeves and Henry Hathaway and everybody else intended them to be seen. Improvements in projection technology — and John Harvey’s almost supernatural rapport with his own equipment — made it possible for him now to do alone what had once taken an entire team of projectionists, and both movies came off without a hitch. John’s print of How the West Was Won was simply flawless: richly brilliant colors without a scratch, splice or line from the first frame to the last. I saw HTWWW four times in Cinerama in 1963 and ’64, and I’ve seen it four more times since the revival of the Cinerama Dome in Hollywood, but I never saw it looking better — or even as good — as it did that Sunday in Dayton. This Is Cinerama was more variable, having clearly been assembled from more disparate sources. There were a number of splices, a few scratches, and a second or two here and there (no more than 10 or 15 seconds overall) when a section of one of the three panels couldn’t be found and had to be filled in with black slugs. (There were even a few seconds, in the canals of Venice if memory serves, imprinted with Danish subtitles — this footage no doubt obtained through the efforts of Willem Bouwmeester.) Even so, it was the real article, no doubt about it; for 23 years I had carried the unhappy memory of the picture’s misbegotten 70mm reissue in 1973 — which should have been called This Isn’t Cinerama — and this erased it completely. Chatting with Larry Smith in the lobby, it was clear that, no matter what the ads said about “for 8 weeks only”, he intended to keep Cinerama playing at the New Neon until the landlord dragged the projectors, the sound console and the screen out the front door and threw them into the street. And that’s pretty much what happened. People came — no exaggeration — from all over the world; the original eight weeks got extension after extension. After a year, the New Neon’s Cinerama matinees were still selling out seven and eight weeks in advance, and the shows continued. On at least one occasion Smith and Harvey screened John’s print of the second feature, Cinerama Holiday (rather badly faded Eastman color, but complete) and the guests of honor were the Marshes (now divorced) and the Trollers, the couples who had starred in it back in 1954. Ultimately, the New Neon’s Cinerama engagement lasted nearly four years of weekends and special occasions, finally drawing to a close in April 2000. Eventually, the landlord followed through on his original plan, and the New Neon is now a two-screen cinema incapable of showing Cinerama. Larry Smith has moved on; he now lives in Culpeper, Virginia, where he works in the film preservation unit of the Library of Congress, speclializing in the salvage and preservation of nitrate film. 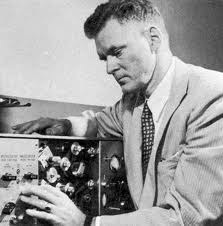 John Harvey suffered a series of health problems in the early 2000s, and was forced to sell off his Cinerama equipment, prints and memorabilia to pay his medical bills. But the seeds of his quest and crusade to preserve Cinerama have borne priceless fruit. His and Larry Smith’s phenomenal success in Dayton from ’96 to 2000 sparked renewed interest in Fred Waller’s lifework. Now, in addition to the National Media Museum in Bradford, there are the ArcLight Cinerama Dome in Hollywood and the Cinerama in Seattle; both had been slated for demolition before public enthusiasm for Cinerama saved them from the wrecking ball, and both were fitted for Cinerama with John’s advice and assistance. Those two theaters owe their new lease on life — and the one in Bradford owes its existence — in no small measure to the dedication, enthusiasm and practical know-how of John Harvey. *Those pictures may yet turn up; stranger things have happened. If they do, I’ll add them here. UPDATE 8/4/13: As always seems to happen, the photographs I took on my trip to Dayton in October 1996 turned up when I least expected to run across them. Here are a couple of good examples. 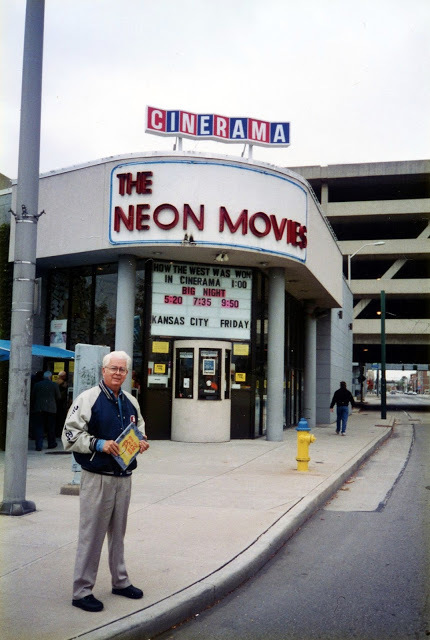 First, a shot of my uncle standing in front of the New Neon Movies as we arrived for the Sunday matinee showing of How the West Was Won. He’s holding one of my souvenir programs for the picture. Just so there’s no confusion about the marquee over the box office: The New Neon ran This Is Cinerama on Saturdays and How the West Was Won on Sundays. The rest of the week, and Saturday and Sunday evening, was devoted to current art-house fare. The marquee shows that the (regular) feature is Big Night, the 1996 hit starring Stanley Tucci and Tony Shalhoub as brothers operating a failing Italian restaurant. Opening on the coming Friday will be Robert Altman’s jazz-flavored Kansas City. And here, finally, is the picture I originally wanted to open this post. This was taken the day before, in the “auxiliary” projection booth set up at the rear of the New Neon’s auditorium. It’s after the showing of This Is Cinerama, and John is carefully monitoring the rewinding of the second half of the feature.